A Sky News report from Ukraine has drawn 110 complaints to Ofcom after a journalist rummaged through belongings at the scene of the MH17 plane crash. Live footage broadcast at lunchtime on Sunday showed Sky's Colin Brazier pluck items from an open suitcase. He dropped them back into the luggage saying "we shouldn't really be doing this I suppose, really". A Sky News spokesperson said both Mr Brazier "and Sky News apologise profusely for any offence caused". 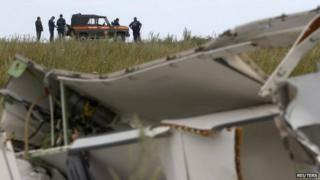 Malaysia Airlines flight MH17 crashed over rebel-held territory in eastern Ukraine on July 17. All 298 people on board were killed. The crash left bodies strewn across several kilometres, as well as plane wreckage and passengers' belongings. Mr Brazier's broadcast showed an array of luggage and personal items, which he described as 'holiday paraphernalia', collected on the ground. The media regulator Ofcom said it was assessing the complaints about the broadcast and had not yet decided if it would open an investigation. A Sky News statement said that "while presenting from the site of the MH17 air crash Colin Brazier reflected on the tragedy of the event and showed audiences the contents of one of the victim's bags. "Colin immediately recognised that this was inappropriate and said so on air. Both Colin and Sky News apologise profusely for any offence caused". The Ukrainian government and pro-Russian rebels have accused each other of shooting down the passenger jet. Ukrainian authorities have released a recording they claimed was a conversation between pro-Russian militants admitting to shooting down the plane. However, separatist leader Alexander Borodai accused the Ukrainian government of attacking the airliner itself. The US and other nations say there is growing evidence of Russian complicity in the crash.